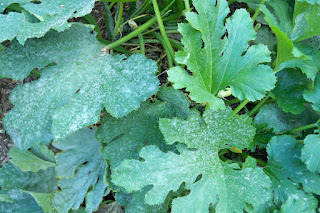 Rehab Or Die: Garden Problem-- powdery milddew on leaves...Help! Garden Problem-- powdery milddew on leaves...Help! OK, so I've noticed some white soft spotting on the zucchini lately, like in the past week or so. I cut off some of the affected leaves, but now it's spread to almost all of the leaves, and one of the plants has died. Kaput. Finito. Pbthhh. Mr Limpy has gone to Washington. I figured the zucc's had a limited life span anyway, so I wasn't TOO worried, but now it seems to have spread to the Bee Balm (Monarda). I'm afraid it's going to take over. Worse yet, my beautiful sage has suddenly (as of this morning) gone Mr. Limpy as well, and it was VERY healthy just days ago when I last harvested a handful. 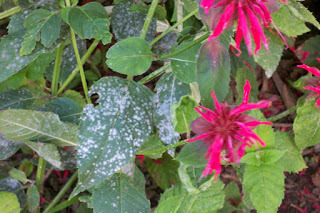 Bee balm always gets powdery mildew if there is just a touch of shade, or lack of air flow. 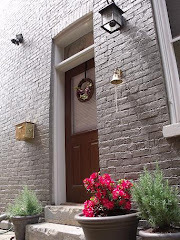 While it has a pretty flower I've always avoided it because of it's powdery mildew issues. 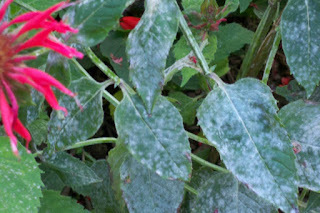 The bad part about powdery mildew is that it's tough to stop once you see it. You can chemically pre-treat for it very well early in the season with a funcicide, but once it's there it's tough to stop. The best ways I've found to limit the damage after infestation begins is to thin plants out to allow more sun and airflow.